Damage to turfgrass from insect pests takes many forms. Feeding by soil-inhabitants such as white grubs, billbugs, and mole crickets usually shows up as wilted, dead or dying grass. Sod may be disturbed in areas where wildlife or pets dig up soil-inhabiting pests. Damage to turf by thatch inhabitants such as sod webworms, armyworms and cutworms is apparent when grass is cut off close to the ground. Damage by chinch bugs and spittlebugs, also thatch inhabitants, is similar to damage caused by soil inhabitants. 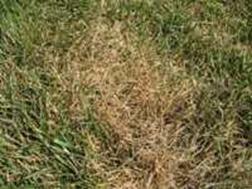 Irregular spots of yellowish turf and dead spots may occur where chinch bug or spittlebug infestations go uncontrolled. Identifying your pest will save you time, money and your lawn. It is tempting to treat white grubs in the spring when damage is apparent, but spring treatments are generally ineffective. The large grubs present in the spring have already done most of their feeding and caused their damage and are now difficult to kill with insecticides. It is better to overseed damaged areas in the spring and wait until late summer to sample for a new generation (concentrate sampling in previously-damaged areas - they tend to return to the same area of your lawn). We recommend treatments between August 1 and September 15 only to those aesthetically important areas of your lawn that exceed 8-10 grubs per foot. Note that (as discussed below) two commonly used insecticides: Merit (imidacloprid) and Mach-2 (halofenozide) must be applied early in the season before eggs are laid in order to be effective against the fall larvae. With these products, treatment decisions should be based upon past history of grub infestation.